Near the Village of Lakewood in the state of New York is where you will find the Southern Tier Brewing Company. 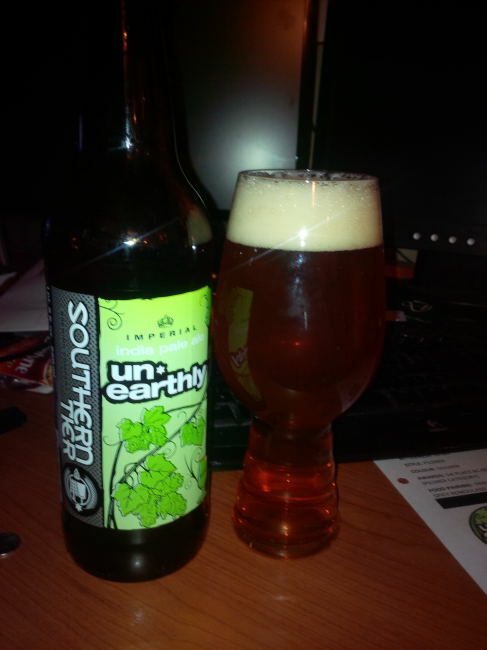 One of their Year Round Imperial brews is their “Un*Earthly India Pale Ale”. The double IPA pours a light copper colour with an off white head. The aroma consists of malts, sweet orange and floral hops. The flavour is of caramel, oranges, pepper, pine and a big hops bitterness. This is a big IPA with an alcohol content that comes in at 9.5%. To say I am happy that this beer has made it to my Province now is an understatement. This is a great double IPA and is worthy of being consumed on this hops crazy West Coast. 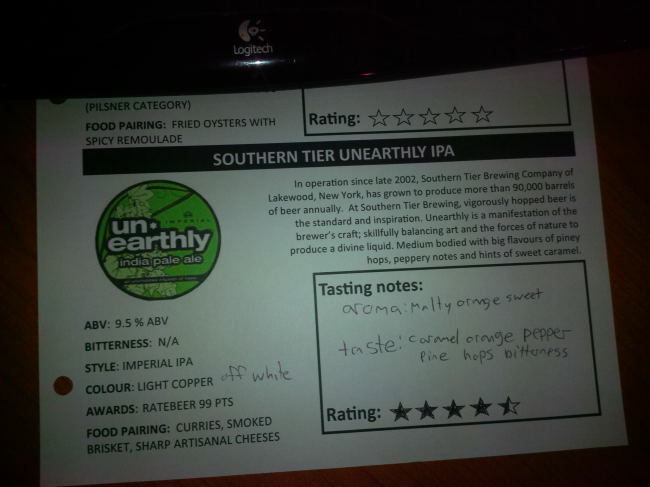 Commercial Description: At the Southern Tier Brewing Company, vigorously hopped beer is our standard and inspiration. We continue a commitment to innovation with our most aggressive offering yet. Unearthly is a manifestation of the brewer’s craft; skillfully balancing art and the forces of nature to produce a divine liquid. Delicately pour a taste into a fluted glass. Smell the enchanting aromas of the hops waft forward as your first sip divulges this beer’s fervent soul. To underestimate Unearthly is to trifle with the mysteries of the universe, so please consume wisely. Food Pairing according to O’hare’s Beer Club notes are as follows: Curries, smoked brisket, sharp artisanal cheeses. This entry was posted in Double IPA, Imperial and tagged bitter, bitterness, caramel, double india pale ale, double ipa, hopped, hops, hopy, imperial india pale ale, imperial ipa, india pale ale, IPA, lakewood, new york, orange, oranges, pepper, pine, southern tier brewing company, usa, village of lakewood.